Early in the scriptural record, Adam and Eve find themselves cast out through the gates at the Garden of Eden. In the Book of Revelation, Christians are promised entry through the gates into the New Jerusalem. 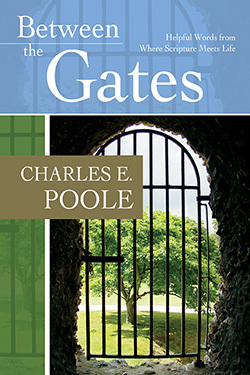 Chuck Poole's many readers know him to be one who speaks to the truth of grace-filled living through the struggles of this world. As with Beyond the Broken Lights and Don’t Cry Past Tuesday, Poole’s latest book will both challenge and comfort as you consider this journey we travel "between the gates." These sermons by Charles Poole are at once beautiful, forceful, and helpful in practical ways. Following the example set by Jesus, the author comforts our troubling fears and troubles our comfortable ideas. I suspect there are few if any serious Christians who would not enjoy and benefit from reading these splendid messages. When I read Chuck Poole, I smile, "whew," repent, want to do better, stand amazed that a preacher can hide so much profound theology and so much good Bible teaching behind such simple stories and one-liners, get immersed in gratitude, and promise to become a more honest interpreter of Scripture. His sermons seem effortless. But my guess is that every offering wrings him out, because each one appears to have gone from his head through his heart and out his very soul. I have been an admirer of Charles E. Poole's writing since the arrival of Don't Cry Past Tuesday, which was a great source of comfort to me in a very troubled time. Poole's writing, like his preaching, offers a rare combination of clear hope and honest reality. Pondering his masterful use of language and imagery both encourages and equips the reader for the journey of faith that tracks between the closed gates of Eden and the open gates of eternity. I’ve been thinking about the image of the "Preacher as Listener." Effective preachers listen well. They listen for the “…still small voice of God.” They listen to the deep currents of people’s lives. They listen to themselves and the ways in which we both receive and resist divine nudges. I’ve just described Charles Poole. Read his books. Listen to him preach. You will say as I do, “This person has the gift of language.” You will also say, as I do, “How does Charles know how to speak and write so poignantly and powerfully?” My response: He knows how to listen!